PHOTO BY RENÉE HEININGER Captain Dale Erne of the Monroe County Sheriff's Office Jail Bureau, and Dr. Tisha Smith, the Jail Bureau's director of inmate drug and alcohol programs, say a new drug treatment unit at the downtown jail is meant to help people turn their lives around. The Monroe County Jail will open its first medication-assisted treatment unit on January 22. The unit will provide dedicated housing and services for inmates with substance abuse problems – specifically opioid and alcohol addiction – who are voluntarily seeking treatment. 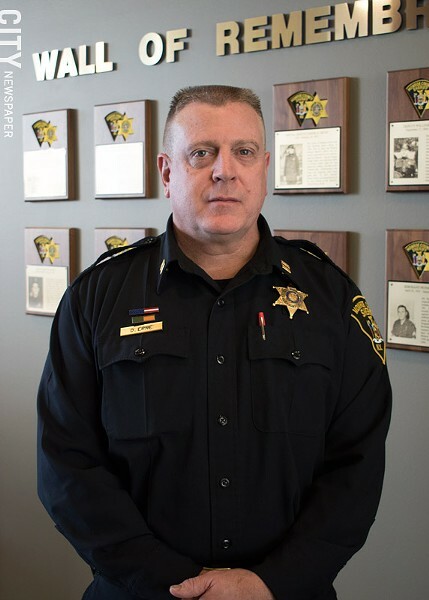 The Monroe County Sheriff's Office operates a full chemical dependency program at its correctional facility on East Henrietta Road in Brighton. That includes opioid addiction treatment programs using methadone and Suboxone, and alcohol addiction treatment using Vivitrol. But the new medication-assisted treatment unit will be the first large-scale drug and alcohol program at the downtown jail, says Monroe County Sheriff's Office Jail Bureau Captain Dale Erne. The ultimate goal of the medication-assisted treatment unit is to prevent both relapses and recidivism, Erne says. It's intended to help people start "straightening out their lives and getting back to be productive citizens," Erne says, and to provide support that they may not otherwise get out in society. Dr. Tisha Smith, the Jail Bureau's director of inmate drug and alcohol programs, estimates that between 85 and 90 percent of the people entering either the jail or the correctional facility have some sort of substance use disorder, but only a small portion want to enroll in available treatment programs. The jail program, which will be based around a physical unit located adjacent to its existing Veteran's Unit, will be voluntary because it involves compliance with medication, Smith says. Every person who is housed in the jail goes through a medical screening when they arrive, and anyone volunteering for medication assisted treatment will have to meet certain medical requirements. The program will be open to both male and female inmates. The jail's medical provider and Sheriff's Office drug counselors will handle different aspects of the initial treatment. A yoga teacher from the correctional facility will be involved, as will some people who do work around trauma, Smith says. Housing services providers, especially treatment houses, will visit to work with the inmates before they're released, Smith says. And each individual will be linked up with a casework from a community organization, who will help them line up things such as addiction treatment services and a primary medical care provider. Those caseworkers will continue working with the individuals once they're released from the jail to the community. "From a rehab standpoint, we're in the business of educating and motivating people to lead healthier and sober lives when they get out," Smith says. "In addition to that, a lot of what we do is helping to provide some sense of self-worth so that they can see themselves in recovery." The program includes some post-release supervision for the participating inmates. Jail officials have wanted to start a treatment unit for quite a while, says Erne, who's worked there for 25 years. They found a supporter in Sheriff Todd Baxter, who helped pursue the $262,500 grant from the University of Baltimore that's helping to fund its start-up, Erne says. The University of Baltimore manages a larger grant from the federal Office of National Drug Control Policy, which targets the development of community-based programs that reduce opioid overdose deaths. Researchers from the university will track data through the Monroe County Jail program on individual compliance and recidivism after release.